Turkey is a country steeped in layers of history and legends. Ruins of the Byzantine and Roman Empires lie scattered along the Mediterranean and Aegean coasts, and Cappadocia’s troglodyte Christian churches and lunar landscape enthral visitors to central Anatolia. The warmth and friendliness of the Turkish people make a motorcycle journey through Turkey a rewarding and pleasurable experience. Stopping to ask the way often results in a place at the tavla (backgammon) table, drinks on the house or an invitation to meet friends and family. The hospitality is genuine and gracious and will accompany you from the metropolis of Istanbul through coastal towns and sleepy villages. Turkish hospitality is matched by its delicious and varied cuisine. Even on the quietest of back roads you are never far from a restaurant or café; often the hub of the village, and an ideal place to meet people. Roads conditions vary from smooth, fast motorways linking the main cities, to bumpy rural roads. Major roads are not regularly maintained and can quickly switch from perfect to pot holed tarmac, but the pace is never fast and the distances between towns not huge. Route: Turkey is a huge and vastly varied country offering endless motorcycling possibilities. If you’ve got two weeks try the following leisurely 1864 mile loop from Istanbul. Istanbul has to be one of the most beautiful cities in the world, so linger a few days to appreciate her many charms. Riding through Istanbul’s densely packed ancient streets is hair raising but someone will always point you in the right direction and, once out on the open road, the pace is leisurely and traffic is generally light. It will take about an hour to ride out of the city to the ferry terminal at Eskihisar for a 30 minute crossing of the Sea of Marmara to Topcular, or, if you wish to avoid riding in the city traffic, you can cross from Yenikapi in the old city to Yalova or Bandirma. Rolling off the ferry you are straight onto lovely mountain roads that wind for 112 miles via the eastern tip of Lake Iznik to Bursa, nestling in the lower slopes of Uluda Mountain. Famous as first capital of the Ottoman Empire, Bursa also has a well deserved reputation for its delicious Iskender Kebab and Kestane Sekeri, chestnut based sweets. Spend the evening wandering the bazaars buying local delicacies to store in your tank bag. Heading north east, the road to Safranbolu follows valleys, lakes and mountains for almost 280 miles. Picnic on the treats you bought at the bazaars as you stop to enjoy the views. Safranbolu is a beautifully preserved Ottoman town, and also a UNESCO World Heritage Site. Soak in 17th Century baths and spend the night in a restored Ottoman house. 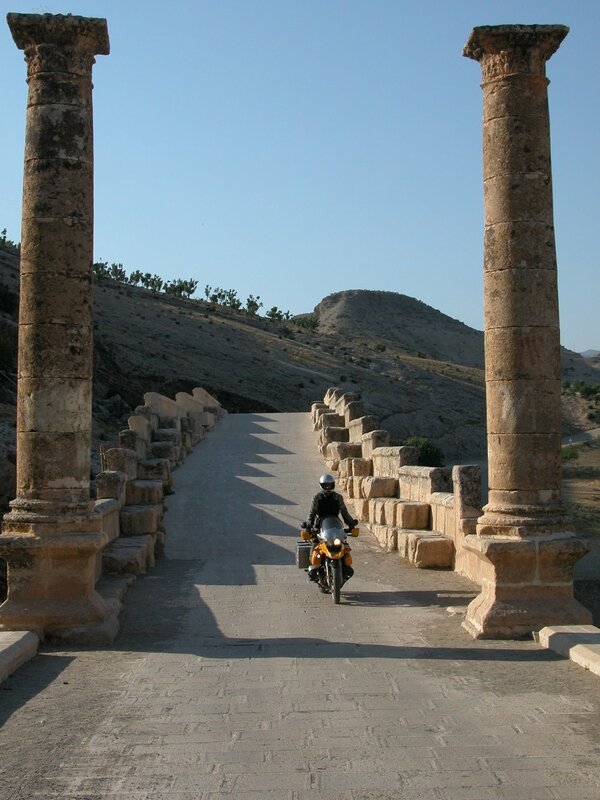 It is a full day’s ride to the unique landscape of the central Anatolian plateau. The road winds through the beautiful mountain passes of the Western Black Sea Mountains, dropping on to the volcanic landscapes of Cappadocia. Ride through valleys of strangely eroded rock formations to cave churches adorned with frescoes, and underground cities carved in the soft volcanic rock. 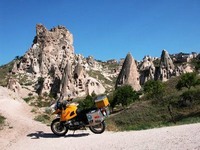 Accommodation options in Göreme and Urgüp are plentiful and varied. Stay in a cave hotel - lovely and cool during the day, their vantage points often command the most fantastic views of the ever changing colours of the rock. Watch the sun set on this mysterious moonscape as you sip the local wine, which has been produced in this region for centuries. It is a fast ride west for 186 miles through the agricultural flatlands of central Turkey to Konya, spiritual home of the mystical sect of the Whirling Dervishes. Departing Konya it is a great day’s ride across the Taurus Mountains to the Mediterranean Sea. Take the secondary road via Beysehir and Ibradi to Antalya, and you will be rewarded with a fantastic 75 mile ride and stunning views. If you want to kick off your boots for a few days the coastal route is lined with archaeological sites, sandy beaches and innumerable places to stay. If you only visit one Greco-Roman site it has to be Ephesus 249 miles from Antalya, just outside the town of Selçuk along the Aegean coast. Beautifully preserved, it is easy to spend a day wandering amongst the temples, theatres and baths. It’s a huge site and definitely not to be tackled in the heat of the day wearing full leathers! 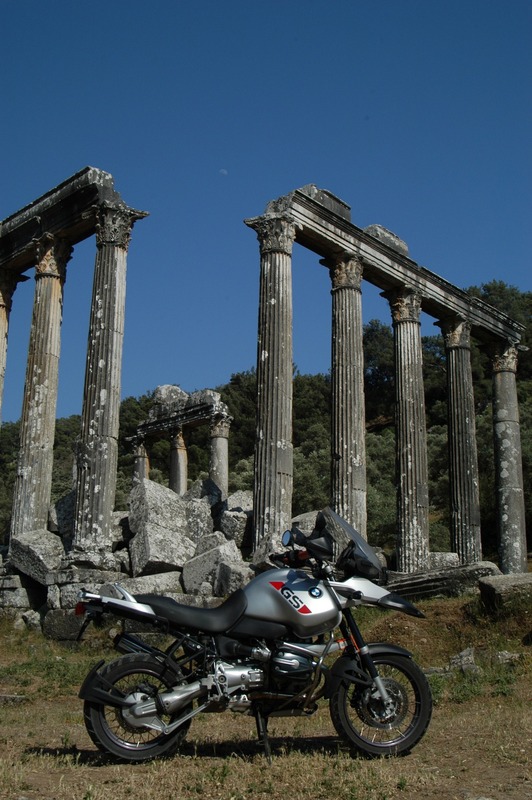 As you ride north along the Aegean coast stop to visit the legendary site of Troy, lying just 12 miles south of Canakkale. There are regular ferries from Canakkale across the Dardanelles to the Gallipoloi Peninsula, the scene of terrible fighting during WWI and now a National Park. From here it is just a few hours’ ride back to Istanbul. Barter in the Grand Bazaar, marvel at the opulence of the Ottoman Empire and admire the beautiful skyline on an evening cruise along the Bospherus. The above journey is an extract from Great Motorcycle Journeys of the World, an inspirational guide to motorcycle touring by Colette Coleman. 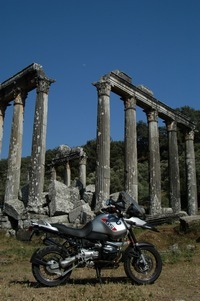 For further information about the book and worldwide tours visit www.greatmotorcycletours.co.uk.